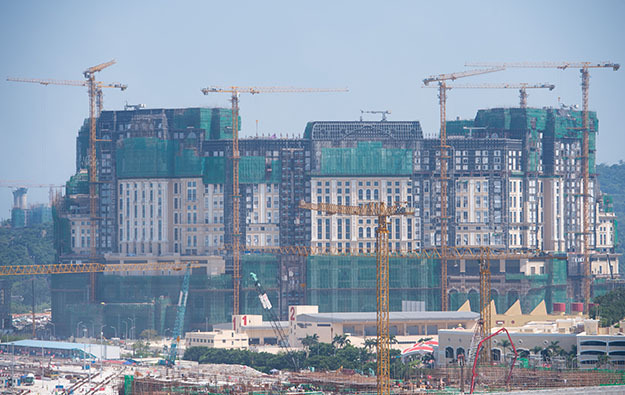 Macau casino operator SJM Holdings Ltd hopes to get circa 150 new-to-market live dealer gaming tables for its HKD36-billion (US$4.6-billion) spend on its troubled Cotai project Grand Lisboa Palace (pictured in a file photo), said the firm’s chief executive in comments to local media on Sunday. Ambrose So Shu Fai said he hoped the “same standard” would be applied to his firm as to competitors that had recently opened new venues. “Our [Grand Lisboa Palace] casino can accommodate 400 gaming tables. Of course the government would not grant us 400 [new] gaming tables. Usually, in the cases of the other Cotai casino resorts, the grant is around 150 new gaming tables [per resort],” said Mr So. Market rival Sands China Ltd got 150 tables for its Parisian Macao resort on Cotai – 100 on opening in September 2016, a further 25 from January 1 this year with the remaining 25 due from New Year 2018 – for a US$2.7-billion capital spend. Sands China had previously stated the Parisian had capacity for up to 450 gaming tables. Wynn Macau Ltd got 150 new tables for Wynn Palace – 100 at its August 2016 launch and 50 more in increments – for a US$4.4-billion spend. The company had said in earlier announcements that the development had space for 500 tables. Several investment analysts have noted however in comments to GGRAsia that currently in the Macau market, optimisation of yield per table from existing operator inventory is more important than headline numbers of new-to-market tables. SJM Holdings recently gave 20 tables from its Macau inventory to a so-called satellite venue, Royal Dragon Casino, which opened in late September. SJM Holdings has the largest portfolio of licensed gaming venues among the city’s six operators. Macau has a policy of limiting expansion of new table numbers to 3 percent annual compound growth for a period of 10 years ending in 2022. “SJM can allocate its tables from the other properties. If we see there is a market need, we’ll allocate some from our properties to there [Grand Lisboa Palace],” stated Mr So. The executive’s comments were made on the final day of the 64th Macau Grand Prix motor sport meeting on Sunday. SJM Holdings is a sponsor of the event and official partner of the SJM Theodore Racing Team. SJM Holdings is aiming to complete the Cotai casino resort project “by the end of 2018” and “on budget” according to its unaudited third-quarter results highlights filed to the Hong Kong bourse on October 31. Brokerage Sanford C. Bernstein Ltd had suggested in an October 31 note that Grand Lisboa Palace would launch only in 2019, one calendar year before the company’s current casino concession is due to expire. Work on the property was suspended by the Macau government for 44 days this summer after the death of a worker on June 18. Work restarted on August 2. The Cotai project had been “adversely affected” by Typhoon Hato in August – the worst such weather event in 53 years – the company had said in its third-quarter results bulletin. The site has also been plagued by several fires of uncertain origin, the latest reported one in late September.